Calgary, Alberta, December 10, 2009 -- QSound Labs, Inc., a leading technology developer of audio and voice software solutions, a member of the ARM® Connected CommunityT, today announced it is participating in the ARM Solution Center for Android, a collaborative resource for designers and developers of ARM technology-based products running on Android, the open source platform from the Open Handset AllianceTM. mQFX, mQSynth, and QVoice are all available today for Android. These technologies expand, enhance and optimized the functionality provided with the default Android package allowing for desired features, longer battery life, and greater file format support (such as SMAF ringtone support). As the market for smartphones, other connected mobile and home devices grows, so too do consumers' expectations for these devices. The ARM Solution Center for Android provides designers and developers of Android-based devices, the assurance that the components used to develop these next-generation consumer electronic devices are up to the task. "QSound supports ARM's strategy of fostering innovations and openness in the connected devices market." stated David Gallagher, President and CEO of QSound Labs. "The launch of the Android Solution Centre is a great example of this strategy". "Android was written for the ARM architecture, the leading processor architecture for internet everywhere applications from mobile to the connected home," said Kevin Smith, vice president of Segment Marketing, ARM. "ARM is fortunate to be able to cultivate a Partner ecosystem that ensures device manufacturers have the best development solutions at their disposal." mQFX is an audio effects suite that delivers leading-edge spatial and spectral audio enhancements along with dynamic volume and range controllers for mobile multimedia devices. mQSynth delivers a high-efficiency real-time MIDI synthesizer for polyphonic ringtones, game music and interactive sound events. QVoice is a unique, feature-rich noise reduction and echo cancellation software solution. All technologies have been highly optimized for all ARM platforms. Since its inception in 1988, QSound Labs, Inc. has established itself as one of the world's leading audio technology companies. The Company has developed numerous innovative, proprietary audio solutions based on extensive research into human auditory perception. These technologies include virtual surround sound, 3D positional audio, stereo enhancement and MIDI Synthesis for the mobile devices, consumer electronics, PC/multimedia, and Internet markets. QSound Labs' cutting-edge audio technologies create rich, immersive 3D audio environments allowing consumers to enjoy stereo surround sound from headphones or from two, four and up to 7.1 speaker systems. The Company's customer and partner roster includes Aricent, ARM, Broadcom, CSR, LG, MiTAC, Panasonic, Pantech, Qualcomm, Samsung, Sony Vaio and Toshiba amongst others. QSound Labs supports its semiconductor, software and OEM partners globally with offices in Canada, Europe, China and Japan. 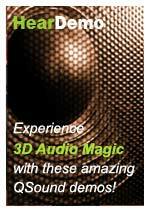 To hear 3D audio demos and learn more about QSound, visit our web site at www.qsound.com.